Congratulations to Nick Jivkov, Winner of Event #5: $1,500 Pot-Limit Hold'em ($189,818)! Event #5: $1,500 Pot-Limit Hold’em is in the books after nine hopefuls played down to a winner Friday night. It looked to be a relatively short day 3, that is, until heads up began. 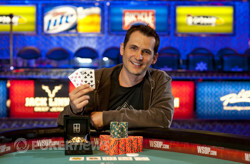 After two grueling levels of back-and-forth action, it was Nick Jivkov who would take home the coveted WSOP gold bracelet. Day 1 began with a healthy field of 639 players. We had no shortage of poker pros in attendance, to be sure. Among those who showed up for day 1 included Daniel Negreanu, Jonathan Little, Barry Greenstein, Shaun Deeb, Gavin Smith, Antonio Esfandiari, John Juanda, Nam Le and none other than Phil Ivey – who made his return to this year’s WSOP after being absent for all of 2011’s WSOP. Of those players, only Negreanu, Le, Juanda and Esfandiari would survive into day 2. Esfandiari, who is commonly referred to as “The Magician,” came in as chip leader and looked to make a deep run. Eliminations ran rampant and of the 71 players who started day 2, only 22 remained within the first six levels of play. Esfandiari was unable to work his magic this time, as he busted in 44th place. Action slowed considerably as the final three tables fought their way to day 3, however, just nine would remain after Thom Werthmann busted in 10th place on the very last hand scheduled for play. Other notable eliminations on day 2 included Terrence Chan (38th), John Juanda (18th) and Nam Le (16th). All eyes were on Negreanu going into day 3, who would come into the final table 6th in chips. Joining him were notable pros Tommy Vedes, Jonathan Aguiar and day 2 chip leader Bryan Pellegrino. When the final table began, seven of the nine remaining players had under 20 big blinds, which made early all-ins inevitable. Even chip-leader Bryan Pellegrino, who began the day with 790,000, could be considered relatively short-stacked with 50 big blinds. Keanu Tabali would be the first victim after finding himself all in with preflop against the of Pellegrino. Pellegrino paired up on the flop and would spike two-pair on the river to seal Tabali’s fate and eliminate him in 9th place. Next to go was John Eames, who found himself all-in preflop with against the of Nick Jivkov. It was a grim situation for Eames, who was nearly a 19-1 underdog going to the flop. No miracle occurred for Eames and he was eliminated in 8th place. Busting out in 7th place was Brant Hale. Hale was unable to get any momentum going and he quickly found himself critically short-stacked. His fate was sealed when he opted to get all-in blind against Vedes. Hale’s would lose out to Vedes’ and he was sent to the rail. Mike Allis was scrappy, to say the least. He was able to double through his opponent’s several times before finally succumbing the Jivkov on a failed bluff. With a board reading , Allis shoved all in over a bet from Jivkov with and was snapped off by Jivkov’s . The turn and river were no help to Allis and he was eliminated in 6th place. The man of hour, none other than PokerStars pro Daniel Negreanu had to settle for a 5th place finish when his could not hold up against Jivkov’s all in preflop. Jivkov would spike a straight on the river to eliminate Negreanu as the board ran out . Tommy Vedes met his end after getting all in on a flop with against Jivkov’s . Jivkov spiked a on the river to seal Vedes’ fate – knocking him out in 4th place. When three-handed play began, Aguiar and Pellegrino would take turns taking chips from each other as Jivkov sat back and watched. Pellegrino would cripple Aguiar after his held up against Aguiar’s . Shortly after, Jivkov delivered the finishing blow when his won a race against Aguiar’s , eliminating Aguiar in 3rd place. Jivkov enjoyed a near 3-1 chip lead going into heads-up play after steamrolling much of the final table, which included five eliminations on his own. However, Pellegrino would not go down without a fight. Pellegrino fought his way up to as much as 900k against Jivkov’s 2 million after doubling through him early in level 26. In the end, however, Livkov would not be denied. Down to his last 300k, Pellegrino decided to make a stand with by going all in preflop after Jivkov raised from the button. Jivkov’s held and it held up as the board ran out – eliminating Pellegrino in 2nd place. 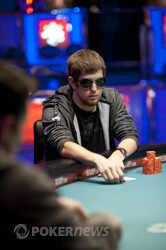 Congratulations to Nick Jivkov, who will take home his first WSOP bracelet and a cool $189,818 for his efforts. 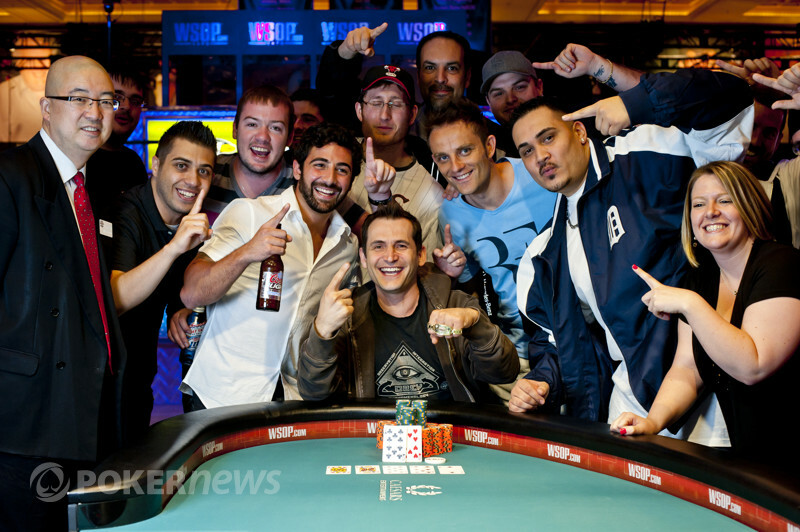 Nick Jivkov defeats Bryan Pellagrino in Pot-imit Hold'em. Bryan Pellegrino seemingly had nine lives in this heads up battle, but his luck has finally run out. Nick Jivkov raised pot, and Pellegrino went all in. Jivkov snap called him, and the cards were flipped up. The flop brought a ton of paint, but it was still safe for Jivkov, coming . Pellegrino could now grab a ten for a straight to win, and the jack would still do for him. The on the turn didn't help, and we were down to the river one more time. There were no more miracles for Pellegrino, as the hit the river. Pellegrino fought valiantly to last as long as he did in heads up play, and he walks away with a well deserved payday of just under $120,000. Bryan Pellegrino is almost down to the felt now. Action began on Nick Livkov, who raised the pot to 180,000. Pellegrino mulled his decision over and decided to flat call, leaving himself just 300,000 behind. The flop came and Pellegrino announced he was all in. Livkov fell deep into the tank. He checked an re-checked his hole cards several times and cut out a call, however, he would not commit them to the middle. After a few minutes, Pellegrino called for the clock and Jivkov was given one minute and ten seconds to make a decision. Livkov continued to tank and the announcer began a ten-second countdown. Livkov finally folded his hand as the tournament announcer reached a "one" count and the pot was shipped to Pellegrino - who now has 660,000. Nick Jivkov raised it up to 120,000, and Bryan Pellegrino called. The flop came down , and Pellegrino led out for 150,000. Jivkov went into the tank, going back and forth with the chips from his stack to the table and back, before ultimately putting out a raise to 300,000. Pellegrino snap folded, and Jivkov took down the pot. Our two remaining combatants have returned to their seats and play has resumed. Lets crown us a champion! The players have decided to make their 60 minute dinner break a standard 20 minute break. We will be back shortly. Here are the updated counts.